I'm going to start this with an artist who I'd really like to decorate with myself. 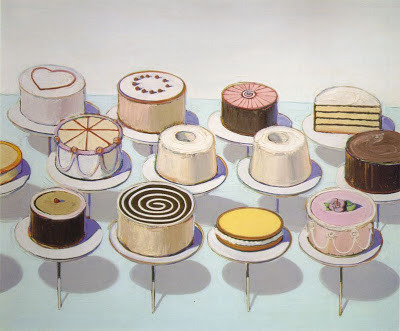 Wayne Thiebaud is an artist who is actually still living (kind of a point of interest, even with modern art) and was kind of at the forefront of the pop art movement. 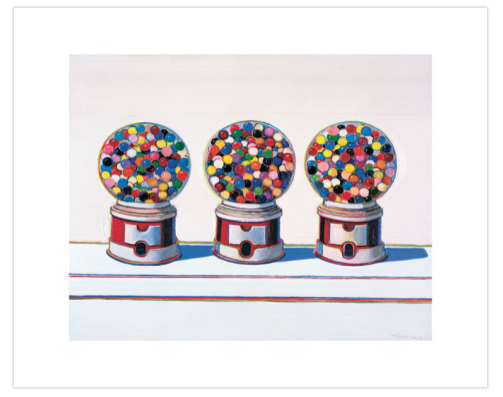 Pop art isn't really the right word for his work and he himself has kind of dismissed himself as a pop artist (and as an artist at all, but that's another thing), saying that his work is more about nostalgia. He's famous for painting lines of food, using super saturated colors and exaggerated shadows against soft white backgrounds. 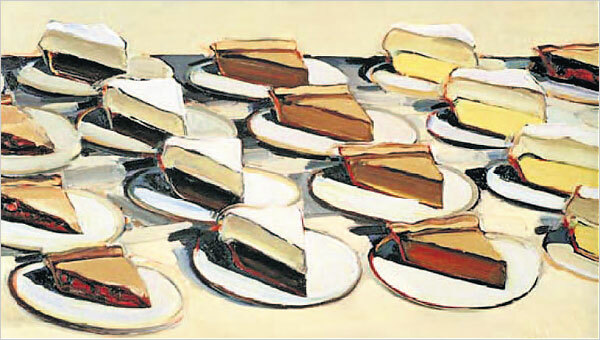 I really love that his subjects are such mundane objects, like the lines of pies that would have been in every diner in America in the 1960's, and that his set up in seemingly mundane as well - just the food arranged without any artistry in one or many straight lines against an empty background. All the interest is added with his heavily pigmented colors and long shadows. It transforms the food from something you'd see every day into something you've never seen anything quite like. 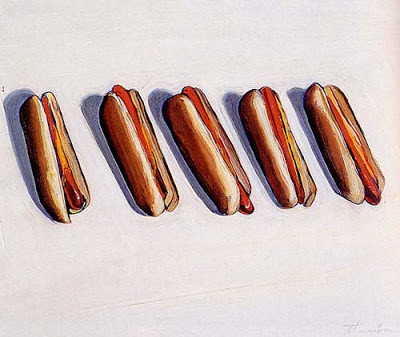 His paintings also have this element of laziness to them, in my mind, but not the bad kind of laziness - kind of the laid back, West coast vibes. Maybe it's the long shadows that make it seem like the day is stretching on. They're also very serene and sad, in a way, even though you'd think brightly rendered paintings of pastries and candy would be anything but. I'm pretty much in love with the idea of hanging a couple Thiebaud prints in the kitchen. 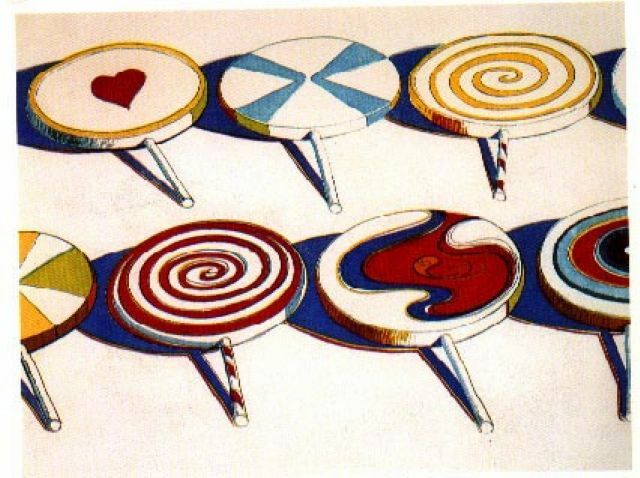 Like, Thiebaud would work perfectly if you're the kind of person who is into fiestaware and colorful appliances and owns a bright KitchenAid mixer. The kitchen is kind of a space where there's constantly something going on. If you're in there you're throwing together a meal or cooking or scrubbing down the dishes. The kitchen is full of action. 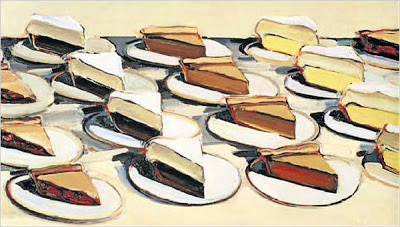 I like the kind of sad serenity Thiebaud prints would add to balance that out. Plus, I feel like a couple of his prints are just meant to be displayed together with their matching white backgrounds and heavy blue shadows and similar compositions that could tie them together. And it's the kitchen so I just like the idea of hanging up pictures of food but still doing it in a way that's unexpected. 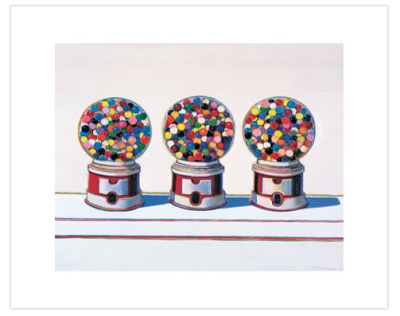 Another great thing to remember when shopping for art: You don't always have to buy prints or posters and you can get more for your money in other ways. Sites like Amazon stock tons of calendars and postcard books featuring fine art and images that might be less accessible on their own. Add postcards to your fridge, stick them to a bulletin board or in a ribborn board, display them in a multi opening collage style frame. Calendars can easily be cut up - that way you'll have 12 different images to choose from and frame.